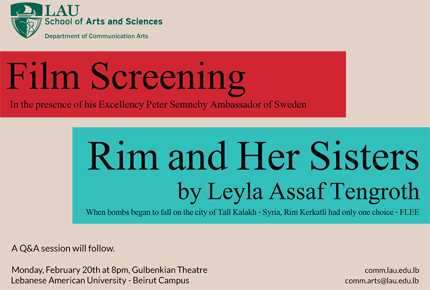 The Department of Communication Arts at the School of Arts and Sciences is hosting the film screening of Rim and Her Sisters, in the presence of his excellency Peter Semneby, Ambassador of Sweden. Leyla Assaf-Tengroth is an award winning film and documentary director, screenwriter and producer. Some of her films are Frihetsligan (1994) and Amelia (1991). Her films and documentaries have been shown on Swedish Television, in several European countries as well as in the US, Canada and Australia. Leyla is a Lebanese who has been living in Sweden since 1966. Her films often deal with sociopolitical problems and environmental issues. They are known to reflect much engagement and insight.